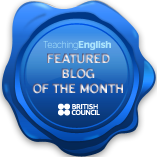 This post was nominated for a British Council blog award! Here’s a phrase list for the CAE speaking exam. There are also some speech bubble powerpoints to drill the language in class, click on each phrase to make it disappear. Drill all the phrases repeatedly taking one out each time until the class can repeat all 5 expressions by heart. I got the amazing speech bubble powerpoint template from https://tekhnologic.wordpress.com/ thanks guys! I (go surfing) to unwind, to escape the stresses and strains of my day to day life. AgreeingWe see eye to eye.Yeah, I’d go along with that. Shall we go with ….? Asking for opinionWhat’s your take on…. ?Where do you stand on….? PersonalisingSpeaking from personal experience,…For me personally,..
Don’t dominate Asking for repetitionI beg your pardon, I didn’t catch that.Sorry would you mind repeating that? Haha, silly me I’ve used it so many times I’ve stopped noticing. Thanks! Hi Tim. Thanks for the mention. It’s appreciated 🙂 I’m glad you’ve found Recall useful. It’s fantastic! I’ve made quite a few of them from your template. I need to sit down and have a play around with power point and work out how you made it. Fantastic! Thanks a lot Ann. An honourable mention should go to https://tekhnologic.wordpress.com/ for making the recall speech bubble powerpoint. Pingback: CEA Speaking Phrases (FCE can use it as well) – ILS English's FCE class blog! You can find all these expressions and a little more than this in Cambridge Advanced Learner’s Dictionary. You can, it’s true but the idea was to put them all on one page for my exam candidates so that they could use them in class and study them at home easily. Nice! You can be easily used in the context of a game or competition. Thanks a lot!